FDA And Cigar Regulation—How Did We Get Here? The United States Food and Drug Administration last week released its Final Ruling, a historic set of regulations that extends the agency's authority to all tobacco products, including premium, handmade cigars. The strict initiatives in the FDA's 499-page ruling, if left unchecked, will severely hinder the manner in which the premium cigar industry conducts business as it grants the agency the power to regulate the manufacture, distribution and marketing of a premium cigar. The ruling did not appear out of thin air, but was rather the product of an arduous legislative process that can be traced back to March 21, 2000. On that day, the Supreme Court ruled in the case FDA v. Brown & Williamson Tobacco Corp. that the agency did not have the power to regulate tobacco products. Ever since the idea of granting regulatory control of tobacco products to the FDA has been introduced, proponents of the premium cigar industry have fought against it through a combination of petitions, lobbying and legislation. 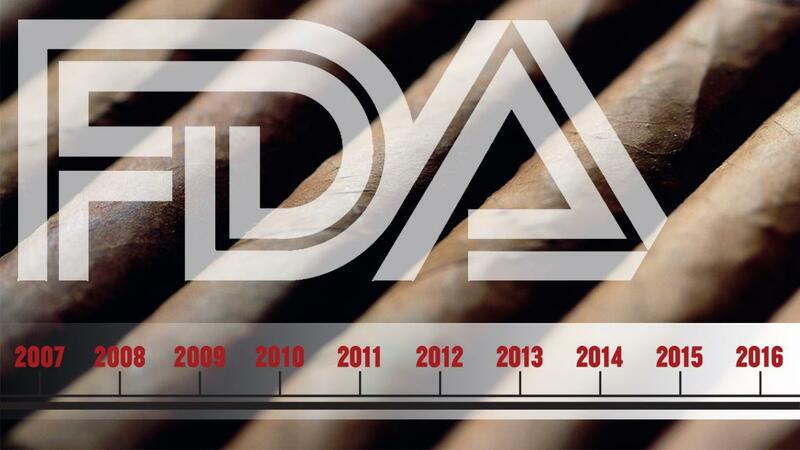 The timeline below highlights several key moments in the long battle to keep the FDA out of premium cigar humidors. The dates refer to the days Cigar Aficionado covered the event. April 8, 2008: The House Energy and Commerce Committee, by a vote of 38 to 12, passes H.R. 1108, otherwise known as the Family Smoking Prevention and Tobacco Control Act. July 31, 2008: The U.S. House of Representatives passes the Family Smoking Prevention and Tobacco Control Act by a vote of 326 to 102. President George W. Bush vows that he would veto the bill should it pass the Senate; however, it never reaches his desk while he's in office. April 3, 2009: The House of Representatives passes H.R. 1256, which is another bill introduced by Rep. Waxman that is essentially the same as H.R. 1108. It is also known as the Family Smoking Prevention and Tobacco Control Act and directs the Secretary of Health to establish within the FDA the Center for Tobacco Products (CTP) to implement this act. June 11, 2009: The Senate passes S. 982, the companion measure to H.R. 1256, by a vote of 79 to 17. June 24, 2009: President Barack Obama signs the Family Smoking Prevention and Tobacco Control Act into law. The FDA immediately impacts the cigarette industry, banning all flavored cigarettes save for menthol, limiting the release of new products, limiting advertising and placing restrictions on the use of words such as "light" and other tobacco products. The cigar industry remains largely unaffected. May 6, 2011: Rep. Bill Posey, a Republican from Florida, introduces H.R. 1639, dubbed the "Traditional Cigar Manufacturing & Small Business Jobs Preservation Act." The measure aims to removes the FDA's jurisdiction over the premium cigar industry by amending the Federal Food, Drug, and Cosmetic Act. August 11, 2011: Florida Sens. Bill Nelson and Marco Rubio, a Democrat and Republican respectively, introduce S. 1461, the companion bill to H.R. 1639. April 12, 2012: The Cigar Rights of America and the International Premium Cigar & Pipe Retailers association submit a formal petition to the White House's petition website. In only 15 days, the petition reaches the 25,000-signature threshold needed for the White House to review. February 12, 2013: Ambassadors from Nicaragua, Honduras, and the Dominican Republic sign a letter addressed to the Obama Administration warning of the damage FDA regulations would have on the countries that produce a large majority of the premium cigars U.S. consumers smoke. April 24, 2014: The FDA announces its Deeming Regulations to enact greater restrictions over the tobacco products, but the organization says that it would consider an exemption for the premium cigar industry, known as Option Two. The agency gives cigar lovers 75 days to comment on the matter (it would later extend this by 45 days). Nearly 80,000 comments are sent. August 12, 2014: Eight senators send a bipartisan letter to the head of the FDA that strongly urges the agency to enact an exemption for premium cigars. February 2, 2015: Rep. Bill Posey again files H.R. 662, known as the Traditional Cigar Manufacturing and Small Business Jobs Preservation Act of 2015, which exempts premium cigars from FDA regulation. February 10, 2015: Sen. Bill Nelson files S. 441, an identical bill to Rep. Bill Posey's House bill. April 12, 2016: Rep. Robert Aderholt (R-AL), chairman of the subcommittee that sets the budget for the FDA, adds a rider to his subcommittee's spending bill that would deny the FDA any funding for its proposed premium cigar regulation program. April 19, 2016: The U.S. House Committee on Appropriations, which establishes the FDA's yearly budget, passes its spending bill. Included in it is language that changes the predicate date from February 15, 2007, to the effective date of the FDA's new deeming regulation on cigars, or August 8, 2016. This rider, as well as Rep. Aderholt’s rider, must pass through the Senate Appropriations process and be signed by President Obama for it to go into effect. May 5, 2016: The FDA issues its Final Ruling and chooses Option One, which does not exempt premium cigars from its Deeming Regulations. Read more about the FDA's Final Ruling.